Red Lobster is the go-to seafood spot for many Americans who like to take a break from typical burger, taco, or pizza joints. The restaurant serves a wide range of popular fish dishes along with steaks, shellfish, chicken, and combination meals. If you scan Red Lobster nutrition facts you'll see that there are healthy items, but also choices that will send your diet way off track. Check both Red Lobster calories, carbs, and nutrient information before you make a final choice. Seafood is often considered a healthy meal choice when you dine in a restaurant. Many seafood choices at Red Lobster are nutritious and healthy. But when you are making a decision about which dish to enjoy, you should evaluate your main meal selection and side dishes separately. In some cases, the sides and sauces provide more calories than the fish, meat, or seafood. For example, if you choose the Lobster Lover's Lunch for your midday meal, you'll get to choose one of three lobster dishes along with a side soup or salad and unlimited Cheddar Bay Biscuits. Let's say you choose the Lobster-Topped Caesar Side Salad which provides 460 calories and 37 grams of fat. Not bad, right? But then if you add a cup of New England Clam Chowder you need to increase your calorie count by 200. And each Cheddar Bay Biscuit that you enjoy will add another 160 calories to your meal total. The result? Your lunch will add 1140 calories to your daily total if you eat the salad, the soup and three biscuits. One smart way to check Red Lobster calories before you dine there is to use the interactive menu online. You can use it to search for a specific item that you hope to enjoy when you visit the restaurant and get nutritional data for the meal, or you can sort by nutritional feature. For example, if you want to see the items with the lowest sodium, click the "Sodium" tab and sort from lowest to highest. You can also click on "More Info" for any menu item to see a full nutrition facts label and allergen information. Many diners enjoy the wide range of seafood available at Red Lobster, so it is not surprising that one of the most popular dishes on the menu is the Ultimate Feast. The meal includes American snow crab legs, garlic shrimp scampi, Walt’s Favorite Shrimp, wild rice pilaf and one extra side of your choice. Nutrition information (shown) includes the wild rice pilaf, cocktail sauce, and melted butter, but does not include the extra side of your choice or any cheddar bay biscuits that you might choose to enjoy. A few of the other popular combos on the Red Lobster menu have similarly high calorie counts, but there are also some that can keep your diet on track. The Wood-Grilled Lobster, Shrimp, and Salmon combines one lobster tail, a jumbo shrimp skewer, and Atlantic salmon, served with wild rice pilaf, butter. The meal provides 860 calories, 43 grams of fat, 56 grams of carbohydrate, 62 grams of protein, and 2240 milligrams of sodium. An additional side dish (included with the meal) will increase these totals. 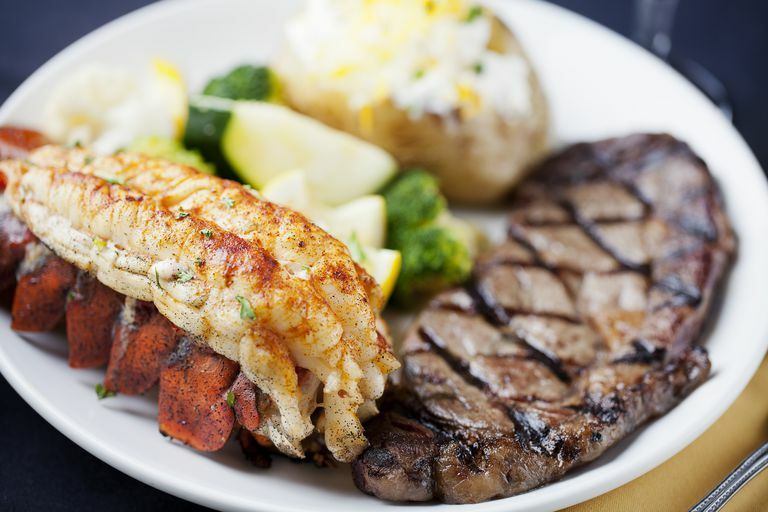 The NY Strip and Rock Lobster Tail combo meal includes a 12-ounce New York strip steak paired, a rock lobster tail, butter, and mashed potatoes. It provides 1140 calories, 71 grams of fat, 30 grams of carbohydrate, 95 grams of protein and 2370 milligrams of sodium. An additional side dish (included with the meal) will increase these totals. The Live Maine Lobster meal includes a steamed whole lobster (1.25 pounds) and a choice of two side dishes. The lobster provides 530 calories, 35 grams of fat, 0 grams of carbohydrate, 54 grams of protein, and 1130 milligrams of sodium. Your two additional side dishes will increase these totals. Popular side dishes include: baked potato (210 calories), coleslaw (260 calories), French fries (430 calories), broccoli (40 calories), and the sweet corn cobette (100 calories). Even though many of the combination meals at Red Lobster are high in fat and calories, there are lighter choices on the menu as well. Check the Lighthouse Selections to find diet-friendly choices. Many of these meals are also lower in sodium. The Lighthouse Garlic-Grilled Shrimp (including broccoli and wild rice pilaf) provides 390 calories, 16 grams of fat, 34 grams of carbohydrate, 30 grams of protein, and 1600 milligrams of sodium. The Lighthouse Maple-Glazed Chicken (including broccoli and wild rice pilaf) provides 370 calories, 5 grams of fat, 53 grams of carbohydrate, 30 grams of protein, and 870 milligrams of sodium. The Lighthouse Rock Lobster Tail (including broccoli and wild rice pilaf) provides 440 calories, 14 grams of fat, 35 grams of carbohydrate, 45 grams of protein, and 1160 milligrams of sodium. Another way to enjoy healthy food at Red Lobster is to choose a seafood item from the Today's Fresh Fish menu and ask for it to be prepared with limited butter or oil. Fresh sole, for example, provides just 200 calories and 4.5 grams of fat. Fresh halibut and snapper also have fat and calorie counts that are similar. If you enjoy the combo meals you can create your own to keep your meal healthy. Combine the Garlic-Grilled Sea Scallops (100 calories) with a 7-ounce Peppercorn-Grilled Sirloin (240 calories) for a healthy, calorie-controlled meal. Lastly, skip the butter on your seafood and choose cocktail sauce instead. It provides just 45 calories per serving and you're likely to use less of it. So what should you avoid at Red Lobster if you're trying to eat healthy? All of the linguine alfredo dishes are high in fat and calories. The Crab Linguini Alfredo (full size) is especially fatty with 1910 calories, 121 grams of fat, 48 grams of saturated fat, 4520 milligrams of sodium. Even if you eat only half of the food on your plate you're consuming several meals' worth of calories, sodium, and fat. Another surprisingly high-calorie item is the Crunch-Fried Fish Sandwich with 1380 calories, 76 grams fat, 15 grams saturated, and 2880 milligrams sodium. Surprisingly, the highest calorie side dish is a vegetable dish. The Roasted Carrots and Butternut Squash With Bourbon Brown Butter will add 310 calories, 16 grams of fat, and 690 milligrams of sodium to your meal. Tartar sauce will add 210 calories and 21 grams of fat to your meal total. Also be mindful of melted butter, which will add 300 calories of pure fat to your meal total. Like almost all restaurants, Red Lobster provides a wide variety of choices, some healthy and some less so. Use Red Lobster nutrition tools provided on the website to choose a food that satisfies your cravings but also keeps your calorie count in control.